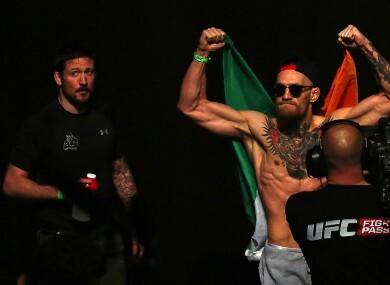 John Kavanagh, Conor McGregor’s head coach, writes exclusively for The42 ahead of UFC 202. John Kavanagh with Conor McGregor. The Garda on duty at passport control was quite confused when he saw me arriving at Dublin Airport yesterday, but he seemed relieved when I put his mind at rest by assuring him that I’d be back there next week to return to Las Vegas. Having been in Vegas with Conor McGregor and the rest of the team since June, the final sparring session took place last Wednesday ahead of his rematch with Nate Diaz at UFC 202 in Las Vegas a week on Saturday. Now we’re tapering down after a very productive training camp, so while I’m currently at home in Ireland to take care of some business here, I’ll be heading back to the US again for a fight I’m extremely excited about. The word we’ve been focusing on for this camp is ‘routine’. We basically did the same thing every day since we arrived in Vegas: Leave the house to go to the gym for a skill session at 1pm, before working on cardio in the evenings. We’ve been following that pattern now for what feels like a long time — about 19 weeks in total come fight night. Although it seems like it has been a long process, we’re definitely seeing the fruits of our labour. There are certain fitness tests that we have numbers on, and the improvements from when Conor began to where he is now have been dramatic. There’s no comparing this training camp to any we have done previously. I can’t stress enough how different this has been. As many of you will probably already know, routine hasn’t been something you would have associated with Conor’s preparations in the past. But this has been like nothing we’ve done before and it’s going to be a massive help for his next number of fights, not just this one. And that’s how it should be done. We’re learning about this art as we go along. The way we’re doing things now is the right way. I strongly believe that will manifest itself in Las Vegas in 12 days’ time. Will we approach every fight in this manner from now on? This scenario in particular is reflective of the style of opponent in question. Nate Diaz is so unique compared to the majority of other fighters in that division. If you look at that run Jose Aldo had for so many years, he always seemed to be fighting small, stocky wrestlers who were trying to develop their striking. Most guys don’t do anything that would force you to raise your eyebrows and recognise something different, but Diaz is an exception. We’ll make a decision on the approach for each fight when we find out who the opponent is. I’ve often spoken of how drastically Conor improves with each training camp, and while there’s certainly no denying that he gets better for every fight, this has undoubtedly been his biggest leap forward yet. Sometimes your feelings can trick you, but when things are being measured, like they are now, then it’s different. Technically there has been a massive jump in the right direction. In addition to that, the amount of analysis we have conducted on his opponent and the strategy and gameplan we have designed, it’s new territory for me. Anyone who knows about the history of SBG Ireland will be aware that we were always regarded as the last-minute gym — the guys who would be ready to step in at short notice. Our mentality reflected that so all you can do in those circumstances is try to get your skillset to such a high level that the opponent doesn’t matter. I believe that worked well for us and the results were proof of that, but I also feel that when you’ve done that for so long, you can end up getting caught out against certain styles of opponent. This has provided us with an opportunity to experience the other method of extreme gameplanning and being very opponent-orientated. It’s been a new approach for me, and for us all. I’d describe it as doing an exam after seeing the questions on the teacher’s test sheet. I feel like we’re almost cheating going into this fight because we know what questions we’re going to face in the test. In every other fight it’s been a fun approach because we’ve been figuring the guy out in the first round. With this one, I really feel like I can describe — technique by technique, round by round — what’s going to happen. Identifying where things went wrong for Conor in his defeat to Nate Diaz back in March was a pretty straightforward process. There were a lot of good moments for him in that contest. To a large extent it’s been a case of looking back at it and dividing the elements into two columns: what was working and what wasn’t working. From there we scratch out what wasn’t working and increase the focus on what was. There were certainly times in the fight where we had a good rhythm going, with some good techniques. But perhaps in our own eagerness to finish the fight, we were lured into areas where Diaz was more efficient. While we have spent a long time — four or five months now — preparing for this rematch, we’ve been working on only a handful of techniques. That includes some new techniques I’ve been working on with Conor which he hasn’t done before, so you can expect to see a thing or two that you haven’t before. I’m confident that this will change the landscape. Patience will be essential for Conor in this fight. I’m veering towards a fourth-round finish in his favour, following an opening three rounds which I expect him to dominate in the same manner he did in the first frame of the previous fight. I’ve been asked if I’m concerned about that dominance potentially tempting him to go after the finish a little too eagerly again, but I’m not. Maybe I would be if I hadn’t seen how focused and keen he is to right the wrongs from the last fight. It’s not a secret that Nate, as well as his brother Nick, can take an enormous amount of punishment, even though we were caught out by it at UFC 196. If you look at their fights, they’re like long-distance runners. They can go for days. They walk through punches like nobody else can. Even if you do knock them down, they don’t react like wrestlers by panicking and exposing the back. They’ll gladly lie back and play guard. If you’re silly, you’ll end up being caught in a submission very quickly. They have the ability to throw shots without having to be concerned about the consequences of being hit. While they’re also not the fastest guys, they’re adept at setting their own pace and maintaining that right the way through. We’re ready for 25 minutes but I do believe that the cumulative damage will have become too much by the fourth round, resulting in Nate’s corner stopping the fight if the referee doesn’t do it before that. This is a very important fight for Conor, but I also feel that my own reputation as a coach is at stake. This contest can be a bit of a game-changer for us all. Some observers who are obsessed with weight classes and belts don’t see this as a very meaningful fight. They’re more interested in seeing Conor defend his featherweight belt and going after the lightweight strap too. But for me, we’re very lucky to be in a position to have an immediate rematch. In most cases, fighters have to be patient in order to get that chance. Having an opportunity to reverse an unfavourable result under the same circumstances just a few months later provides us with a chance to show that ‘Win or Learn’ isn’t just a catchy phrase. It really is something we practice and we have done for a long time. I know Conor will do himself proud, while also proving that methodology to be correct by ensuring that this fight is very one-sided. I do believe that this win must be very dominant. It can’t be a close decision or anything like that. In that case there won’t be much satisfaction. We want to deliver a contest which will remove any doubts or questions in the aftermath. We want to put a definitive stamp on this to prove that for us, it really is a case of win or learn. I firmly believe that Conor’s loss to Diaz earlier this year will turn out to be a significant turning point in his career, which will really stand to him as we embark on this next part of the journey and the next batch of fights, whether they’re at featherweight, lightweight or welterweight. We know what routine to follow now. Technically speaking we were already quite sound. Routine was the missing link. We have it now and I’m very excited about moving forward with it. There can be no excuses here if we don’t get the result we’re pursuing. The preparation has been flawless. But the reassuring thing from our point of view is that I know we won’t need any excuses because it’s not going to come to that. Email “My reputation as a coach is at stake in Conor McGregor's rematch with Nate Diaz”. Feedback on “My reputation as a coach is at stake in Conor McGregor's rematch with Nate Diaz”.